We all know Apple uses the iPhone to sell applications at the App Store, but what about the notion Apple is using applications to sell the iPhone at the Apple Store? 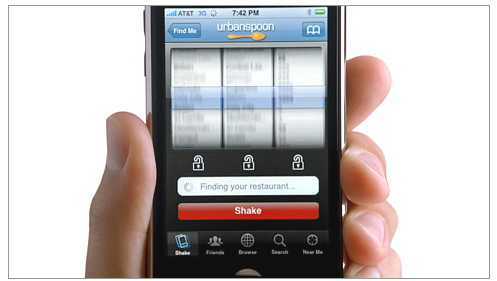 Last night, while watching episode 2 of Top Chef, the iPhone commercial promoting the UrbanSpoon app appeared twice. Given the content of the show and the given audience, this ad is extremely relevant. The question is whether this ad is to push the Urban Spoon application, the iPhone or both. Based on the fact that Apple makes no money on this free application, it is safe to assume Apple is using the vast collection of applications to make a compelling case for why you should purchase an iPhone. The use of application as creative messaging gives great possibility to how targeted the ads can be.